When you choose to schedule a consultation for cosmetic and restorative purposes, your dentist will provide you with a smile analysis to determine which treatments will suit your needs best. When building your new look, consider the issues you want to solve ahead of time so you can explain them properly during your visit. Your dentist will create a customized package of treatments that meet your vision, budget, and schedule. They’ll also be able to determine if any issues need resolving before pursuing cosmetic treatments, as these can affect the overall success if not addressed prior to treatment. The foods you eat can dramatically affect the whiteness of your teeth over the year, including berries, coffee and tea. 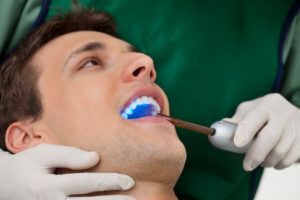 To improve this discoloration, many patients pursuing cosmetic services in Mansfield will opt for in-house teeth whitening as well as at-home teeth whitening kits. This discoloration can occur based on your age, genetics, and medications you’re taking as well, but in many cases dental practices can improve the color of your smile by several shades over a single visit. This means you’ll spend more time celebrating your new year and less in the dental chair. For those wanting to cover/replace gaps, chips, or rough and jagged edges on your teeth, there is a solution. Through cosmetic bonding and contouring methods, your dentist can transform the shape as well as the look of your teeth. In this process, the dentist applies natural-looking composite resin to the surface of your tooth which is then hardened with an ultraviolet light. Composite resin can also be used in fillings, different than the silver-colored ones of the past that affected the overall look of your smile. This material can be shaded to match the exact color of your remaining teeth. This way you don’t sacrifice protection of your tooth when building your smile for the new you. Don’t hesitate to transform your smile for 2018. Contact your local practice today to learn more about Smile Makeovers in Mansfield. Dr. Sandi L. Hamm earned her bachelor’s of science degree in Dental Hygiene from the Baylor College of Dentistry. With decades of experience in creating aesthetic improvements in your smile, her team is ready to provide a smile makeover you’ll love in the new year. To learn more about treatments options as well as her practice, you can visit her website or schedule an appointment at (817) 477-4441.